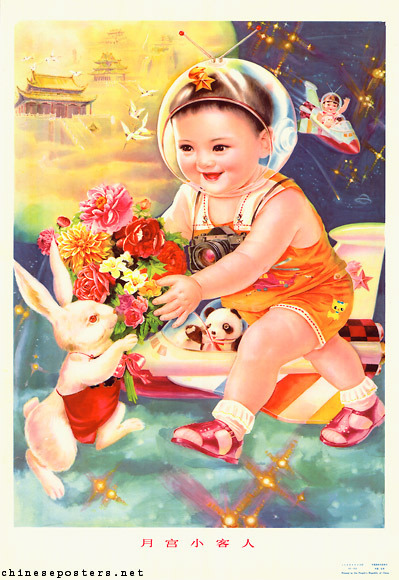 Coverage of the Chinese Space Programme, with some amazing artwork from the 1960s onwards! The succesful launching of the Shenzhou V, the Divine Vessel, on 15 October 2003, withtaikonaut Yang Liwei on board, marked a giant leap forward in the Chinese space program that saw its origins in the 1960s. With this result, China joined the club of space-travelling nations that previously had been limited to the United States and the Soviet Union/Russian Federation. A previous Chinese launching , in 1970, had already brought a satellite into orbit that endlessly broadcast Dongfang hong (东方红, The East is Red), not the national anthem, but probably one of the best known Chinese tunes, eulogizing Mao Zedong. The success of this mission was solely ascribed to the genius of Mao Zedong Thought, which had guided the scientists and workers. In reality, Qian Xuesen (1911-2009), a rocket engineer formerly attached to the Jet Propulsion Lab in Pasadena, California, U.S., who had been expelled in the 1950s for suspected Communist sympathies, designed China’s first missiles, earning him the accolade of being the father of the space program. – continue reading and to see more art!